We have a cherry cabinet to make that will have solid lumber panels inside cope & stick door frames. The panels will be 3/8 to 1/2 inch in thickness. Overall width approximately 15 inches. Would like to keep the cathedrals on the wood grain matched visually. The first thought is to laminate this in 3 pieces with the cathedrals all aimed towards top of door. The second idea is to split & re-glue the 5 inch boards such that the relative alignment more or less matches the first idea. 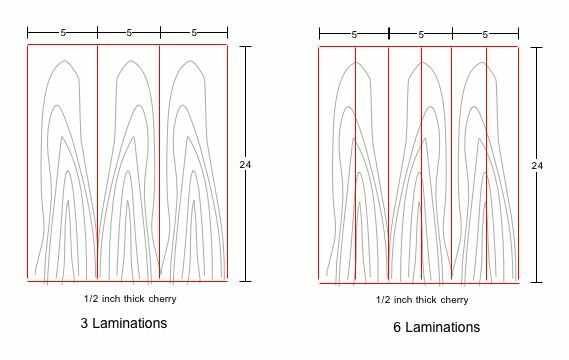 The only difference would be 6 laminations instead of 3 (without any flipping of grain direction). Would one of these methods produce more panels that would stay flatter over time? I want to be clear that both scenarios involve using just three boards. Scenario 2 splits these boards into six pieces rather than just three. The additional work of ripping and gluing the wood to a six piece assembly would have no appreciable effect on stability. Expansion/contraction is the same, tendency to cup would be the same because grain orientation is maintained. Starting with properly dried lumber is the key. Do the calculation for predictable exp/con of the panel and allow for it in the frame. A thin panel will not exert as much cupping force as a thicker one. I wasn't terribly concerned about the expansion & contraction as I have that planned for in the door construction. My primary concern was for the effects of cupping force. I think we will limit the overall thickness to 3/8 inch for this reason.